Mubarakan has received good reviews from critics for a comedy film. The average rating from 17 reviews that we have compiled so far is 3 stars. Mubarakan is one of those films that entertains from start to finish, a ‘paisa vasool’ entertainer of a dysfunctional Punjabi family. It doesn’t get into slapstick zone, the funny scenes haven’t been forced into the screenplay to make the audience laugh. Instead, what we get is a bunch of actors who excel with their comic timing and situations that will have the audience in splits. The first half is excellent, Anees Bazmee is in top-form, as good as he was in films like ‘Welcome’ and ‘No Entry’. Things begin to slow down in the second half and as the drama takes over from the comedy, the film gets more predictable. But ‘Mubarakan’ does end well. MUBARAKAN doesn’t have a proper commencement. Too much information is fed to the viewers in the first ten minutes. The introduction of characters is done haphazardly and even the jokes at this point aren’t that funny. However, the fun begins in the sequence where Charan goes to Binkle’s mansion for arranged marriage talks and hell breaks loose. From here, the film goes on a high and boasts of several funny and dramatic sequences. The intermission point arrives at a great point. Shockingly, the film goes downhill in second half. The film ceases to be funny and gets stretched. The film picks up in the climax and the film thankfully ends on a good note. Giving away too much will spoil the fun that you’re meant to have watching this. So you just have to go through this garrulous, laugh-out-loud affair with the usual patience and perhaps even some perseverance that you usually reserve for Bollywood comedies such as this one. Anil is the scene-stealer with his half Brit-half Punjabi act lifting the film throughout. Arjun’s double-act allows for some smiles and the girls, Ileana, Athiya and Neha are easy on the eye, though they’re just decorative set-pieces. Ratna and Pavan add weightage with their stellar acts, though Pavan should have kept it down in the dramatic portions, where he is much too loud. Adding more will spoil the fun but one thing is sure, MUBARAKAN is a WELCOME clean family entertainer. Anees Bazmee brilliantly rounds this up well into a colorful, happy laughathon showcasing the Chacha Bhatija duo – Anil Kapoor and Arjun Kapoor in ‘jhakaas’ form. The tactics and antics of Anil Kapoor in this film to solve problems by his weird inspirations from things happening around is a cracker. Anees Bazmee is spot on right from the word go in this rib tickler and manages to chip in a ‘family’ message in this entertainer which gives a deja vu of his previous directorial venture READY during the climax. The second half looses the steam in between and drags a bit but nevertheless the superlative performances and enough LOL (Laugh out Loud) moments makes MUBARAKA a fun filled enjoyable shudh desi Indian laughter shot in sadda Punjab and London. Mubarakan is designed as a family film where comedy is generated through quarrelling relatives. This works initially but goes out of control later. But that doesn’t mean you won’t be entertained. You’ll be occasionally laughing, but probably won’t be leaving the theatre with a big smile on your face. The humour in Mubarakan does take a bit of time to set in. Don’t go expecting the gags and jokes to come early on. Bazmee takes time to establish the emotional connect between the characters giving us their back stories before beginning the fireworks. The Punjabi songs are many and while they will appeal to the North, the soundtrack could have had more Hindi tracks. The climax of Mubarakan has a speech and while it is imperative to the storyline it did seem a bit gimmicky. Mubarakan is the cleanest entertainer and deserves to be watched for its high entertainment value. As for the film itself, Mubarakan may not be as good as Bazmee’s No Entry or Welcome, but it does manage to provide wholesome entertainment for the entire family. The comedy is clean, the gags are laughable, the characters are crazy and the plot is well written. Bazmee deserves credit for coming up with yet another whacky plot with misunderstandings galore that will have you chuckling in your seats. Though there are parts, which stretch unnecessarily, you are ready to forgive the makers for it as Anil Kapoor compensates for it with his presence. I have been a big fan of Anil’s sense of humour and his comic timing and the Mr. India doesn’t disappoint one bit in this film. Arjun Kapoor, who doubles up as Karan (the smart guy) and Charan (the duffer), proves a point with this madcap. This is Arjun Kapoor’s second double role after Aurangzeb, and he rocks. Anil Kapoor, the bumbling, ideas-generating Kartar Singh Bajwa, who plays Karan’s mamu and Charan’s chachu, adds heft and charm whenever the film’s pace dulls down, which is like the first 10-15 minutes. Ileana D’cruz is coming into her own in comedy films and while Mubarakan gives her a solid platform, she doesn’t let her fans down. As Sweety, the hot-headed Sardarni, D’Cruz looks like a million bucks too. Athiya Shetty’s Binkle is hardly there in the first half of the film and when she does get a chance in the latter half, she too walks into your hearts with ease. The great Indian family values, the tradition of engagements and weddings are played to the gilt. Which means you will wince more than a couple of times at the sheer volume of background music and yelling of the dialog. But the director uses everyday things – like Pavan Malhotra gargling loudly in disapproval in a scene – rather well. It annoys me to see that the director has not given up on his penchant for showing ‘white’ people as domestic help in Indian households, and making white actors speak Punjabi for cheap laughs. Anil Kapoor is simply fabulous, and you cannot miss the mad, high energy performance of the man. Watch! Overall, Mubarakan is a happy film which is meant for your entire family. The film will surely get back the era of clean family entertainers. Don’t expect much from the plot, but it is a decent watch this weekend. How many Arjun Kapoors are required to crack a comedy? Based on this film, clearly not enough. While his approach to comedy could be equated to Aftab Shivdasani’s to espionage thrillers, in this double role, he splits the atom and is equally unbearable in both avatars (the unnecessarily giggly and the perennially-hesitant-because-shy). But if you watch this film, it has to be for Anil Kapoor who, despite armed with below-average writing, lends some dignity to his outlandish Kartar Singh. Both Ratna Pathak Shah and Pavan Malhotra deliver the emotionally-charged scenes with the reserve of veterans and deliver on the job. While female cast members in such films are reduced to dispensable props, Ileana D’Cruz holds her ground and dazzles each time she’s on screen. If Athiya Shetty were ever to be included in Madame Tussauds, it is likely that her wax impression would be more animated than her. Furnishing a range of blank stares, Shetty is the least impressive from a cast which also includes Neha Sharma and Arjun Kapoor. Mubarakan only prolongs the inevitable, with the sole source of humour being Kartar Singh generate inane solutions and then see things fall apart repeatedly. The film best works when it is ingeniously silly such as the random mannequin in the back of Kartar Singh’s Hummer or when he spots an angel loitering in his garden as he talks to his brother’s ghost. A mobile hawker named Izzat ka Falooda takes the cake though. Less tone-deaf humour, more quirks, a shorter running time and a more able younger cast and Mubarakan could have been more delightful. The rigmarole is enjoyable up to a point but once the idiocy quotient peaks, the overlong Mubarakan goes somewhat haywire. Yet, if it isn’t as insufferable as other average Bollywood romantic comedies, a part of the credit goes to the actors. Anil Kapoor, who is as irrepressible as ever, lends some lustre to the proceedings with his impressive energy levels and funny one-liners. Arjun Kapoor is far less consistent in his double role, but he does strike a few purple patches along the way, demonstrating a comic flair that cries out for a better film than this one. The script gives Athiya Shetty the rough end of the stick. Her character, as Kartar says at one point, is like a tennis ball being lobbed back and forth between Charan’s side of the court and Karan’s without being allowed any agency of her own. Mubarakan, however, gives Ileana D’Cruz far more space and she makes the most of the opportunity. The pace does take its time to pick up early on and the humour gets repetitive in some portions. Also, Athiya’s track seems underwhelming. Neha Sharma and Karan Kundra have important roles but little screen time. Bazmee manages to raise the tempo in the second half only to lead us to a seemingly dull climax. Mubarkan also has too many songs that could have done with some better editing. Mubarakan is one of the most entertaining films of 2017. Arjun Kapoor’s double role act and Anees Bazmee’s superb direction make it a total paisa vasool experience. The first half of the film keeps the momentum and comic elements to the maximum. Somehow, it dips a little in the second half only to be lifted by Arjun’s final line. The music, while not so outstanding goes hand in hand with the film and will easily work for parties. There is a bit of rona-dhona too, but no family entertainer is complete without that, right? The best part is that Anees doesn’t exploit the ‘twin-angle’ like most twin character films. Playing double role, Arjun has done a fantastic job; he doesn’t leave his loud character as Karan and maintains the sober and calm persona as Charan throughout the film. The only time you see the actor slipping from the character is when they get on the dance floor. Without doubt and as expected, Anil Kapoor steals everyone’s thunder with his performance. He keeps the entertainment quotient going. Ileana D’Cruz tries hard to fit into the ‘Punjab Ki Sikhni’ character, but is not that effective, while Athiya Shetty as the shy and demure bride-to-be is almost non-existent. It would be unfair to not mention Ratna Pathak Shah and Pavan Malhotra, who keep the story running with their talent as experienced actors. The film is definitely high on humour. But, the comedy spills and bits and pieces. You will surely feel that there is a lack of consistency from the director. However, when the homour strikes, it is powerful enough to make you forget everything and leave you in splits. 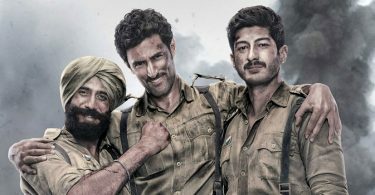 In the first-half of the movie, Arjun tries to flaunt Punjabi and firangi swag by portraying two different characters. Sadly, somewhere down the line, you will start feeling that the 32-year-old star is trying too hard and failing to yield the results. In the end the film is the same old comedy of errors that we’ve seen so many times before. Anil Kapoor is the secret sauce of Mubarakan whose incredible timing uplifts many a dull patch. But the film is unmistakably indulgent and over-long and could’ve done with some serious pruning. Right now it works only in fits and starts. You’ll laugh, but not throughout. Let’s just say it falls somewhere in the middle on a scale of Ready to No Entry. The finale is decent but should have more funny elements attached to it.The humour dries out in the middle portions, but tries to make it up in the later part of the film. Arjun-Neha-Athiya track starts on the right note, but fails to enhance. It’s a bit cluttered and unconvincing. Due to the weak writing of this part, the track of Arjun Kapoor gets diluted. Some of the characters in the film are super loud. Music has to be fantastic or peppy in such kind of films. It’s just that couple of tracks are not up to the mark and the finale should have been more entertaining. Neha Sharma, Rahul Dev, Karan Kundra are wasted. The writing is brisk, brusque. and innovative, though the film needed to be at least half an hour shorter. On the plus side, the cinematography (Himman Dhamija) and the background score (Amar Mohile) are super-slick and appealing. Anees keeps the humour completely free of sleaze. And that’s no mean achievement. The performances were in line with whatever is expected from this genre of Hindi films – loud and over-the-top. I was pleasantly surprised that Ratna Pathak Shah could have some grace because her character wasn’t completely caricatured. Same goes for the actor who plays Pawan Malhotra’s wife. So, except for the slight improvement in story, the genre goes on with the rest. Thankfully, It doesn’t have the slapstick that we have come to expect. The song and dance aren’t that upbeat. I am not sure then why even someone who likes the genre would watch this one. Me? My worries take me into the future. The only people thrashing Mubarakan will be SRK fans just beacause they fear this movie may harm JHMS if it is carrying extremely positive word of mouth. Seriously, instead of criticizing this movie a cine lover would be happy that the industry can get a hit in the form of Mubarakan. Will watch it with my family…..
Ur review for mubarakan is GREAT…. Ki & Ka surprised me…. Hope Mubarakan also in same league…..
Inder Kumar actor passed away..
4/5 no doubt . Complete family entaertainer . Limited release in Dubai but all shows were packed . Every body loves the movie . Content is the real king . Proved once again .